Opening day has a magic all its own. Sleepless nights and various rituals along with the opportunity for hunting unwary game make the magic. Waterfowling is perhaps the most infectious opening day because of this overwhelming magic. I remember my first hunts as a kid not yet old enough for big game. Now that my boys are getting the bug, I’m not sure if it’s more amazing for them or myself. Pair the opening day syndrome with the special Youth Weekend, where kids are the only hunters allowed, and something good is afoot. When Terry Embertson of River Forks Game Calls suggested we take the boys to his old stomping grounds in Klamath, Oregon, the conclusion was foregone! Opening morning found us tromping through new, although familiar mud, setting duck, honker and spec decoys in a flooded grass field. There were plenty of missed opportunities early in the day before Josh settled into some serious wing shooting. 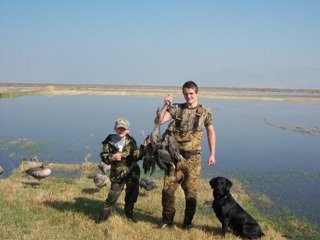 Pierce, my younger son, struggled with his shooting and ended up helping finish the job on several birds. Our goal for the weekend became getting Pierce his first duck. The first day ended with Josh’s first duck limit and first Specklebelly Geese, a triumph! The local waterfowl community put on a youth lunch at the campground and area headquarters. The second morning we decided to focus on ducks in a large tule pothole area. Again the morning opened slow and then turned into one of the most amazing duck hunting trips I have ever witnessed. Because of the muddy and uneven footing in the tules both boys struggled with the wing shooting. My fear that Pierce wouldn’t kill his duck started to build. I should have known better. Flock after flock of uneducated birds locked onto our pond and dropped their feet. Soon a gadwall committed and landed at 23 yards. Pierce took his time and potshot the unfortunate duck! Success. Terry has quite an eye for shooting and we noticed several of Pierce’s shots were getting extremely close. A hen mallard dipped in on Pierce’s side of the set, and with one resounding shot the bird folded up hard! Almost too good to be true for a Dad and a waterfowler – this is close to heaven. The second day ended with Pierce’s first bird and first wingshot. Josh managed to kill his first BIG honker and ended the day with good success on ducks. Youth weekend was a resounding good time for all. Many thanks to Terry and his amazing goose calls and calling. Check your local regulations so you too can take advantage of the special opportunities to get the kids out in the woods and marsh. Interested in reading more about hunting with kids be sure to check out our other articles.